Welcome to my nightmare, this is one of the most confusing one day charts I have looked at in quite a while. From afar, the larger counts look like a 4th wave, but the micro count is a REAL mess, almost like an on going "B", or "X" wave, the triangle I have labeled as a-b-c-d-e, breaks the first rule, wave "A", is a five count, we need a 3-3-3-3-3 count for the triangle to be valid. A simple zig-zag is still possible, but wave "C" needs to be the largest for that count to work. The other possibility is that we have had a top put in, I have seen numerous counts in the last 24 hours that have a five wave count completed, the micro-counts in them might be off, but at this point I am keeping that option on the table until the impulse count from 1037.63 is invalidated. One other option, which I had a chart up of yesterday on my public list, is this whole rally counting out as an a-b-c-x-a-b-c, making wave b of B, of P2, an expanding triangle with the a of B ending at 979. 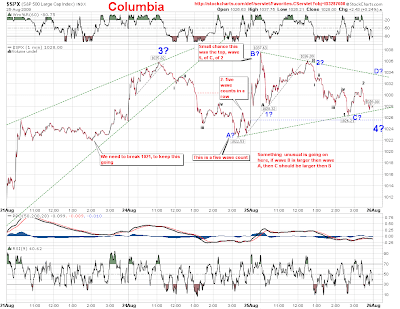 This could really surprise the bears if we start heading down to make new lows, then quickly reverse in wave "C" up.